Materiality is a collection that explores new materials for textiles and accessories meant to inspire fashion and accessories designers. Much like writing a second novel, I imagine one of the most difficult aspects of being a maker is following up a collection with something that is equally, if not more, inspired. And when that collection is particularly unique and stunning and, dare I say, sublime, then the pressure is really on. When we first profiled her, Andreea Mandrescu showed us “Inlaid Skin,” a set of flexible pieces that attach to and wrap around the body—accessories that serve as a second, much edgier, far lovelier skin. The collection filled us with awe and wonder and the sense that we’d never seen anything like it before or since. “Materiality” by Andreea Mandrescu, image courtesy of Andreea Mandrescu. Until now, of course. With the introduction of “Materiality,” a stunning continuation of her previous works, but with new vision and just as much revelation, Andreea manages to create another incredible tactile and visual experience. Inspired by jewelry and precious stones, the collection takes a flexible, fluid, and much more playful approach to adornment. Exploring materials and forms in both textiles and accessories, Andreea takes everything you could want the objects around you to be and turns it into a reality. Her pieces are so much more than simply something to wear. Have you ever had a fashion statement feel so perfect that it seemed like of an extension of yourself? With Andreea’s pieces, they actually are. And we’re totally fascinated. We can transform any two dimensional pattern into a three dimensional rubber application in any color on a wide variety of fabric bases, for fashion, accessories and interior design. .
Born in Piatra Neamt, Romania. The inlaid pieces, due to their flexibility and ease in manipulation, can be attached and wrapped around the body. The colour and the translucent quality of the material used can give the illusion of an ‘inlaid’ skin as the surface of the accessory becomes almost one with the skin, or a three dimensional extension of the skin. 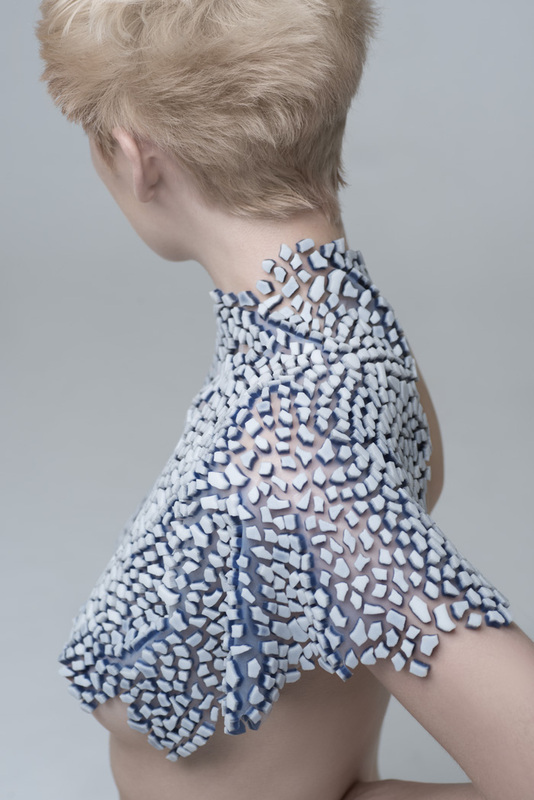 Studio Andreea Mandrescu is a design studio based in London specializing in textile, material and surface design. The studio produces unique range of inlaid and overlaid fabrics that explore different combination of materials to include faux fur, silicone, leather and wood veneers. The fabrics are versatile, made to fit pattern garments for fashion design to being wrapped around the body as accessories. Similar range of fabrics is available for soft furnishings and upholstery. The studio offers bespoke design services. Any drawing or sketch can be transformed into a three dimension silicone application in any color on a wide variety of fabrics for fashion, accessories and interior design.